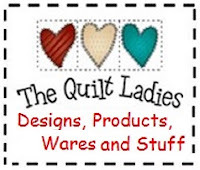 The Quilt Ladies Book Collection: What a Wednesday Quilt Pattern Block Tutorial - Basic to FUN ! What a Wednesday Quilt Pattern Block Tutorial - Basic to FUN ! A little change and a completely different quilt block is yours. Finished size is 8" x 8"
The Fun Block, changing the corners into triangles. Add more fun, change the red to a 4-patch cut size 2" x 2"